Weekly Wrap Up! 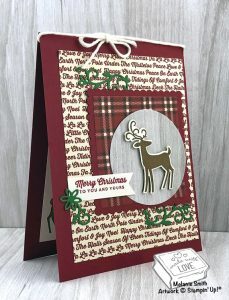 ~ Dashing Deer Bundle ~ Quick and Easy Card to the Rescue!!! Is it Friday already? 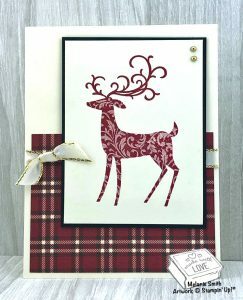 I am here to share an extra sample as we wrap up our week using the Dashing Deer Bundle. I hope you have enjoyed all the samples I have share this week. I sure have had fun sharing them with you!!! Are you member of my facebook business page or customer group? If not simply click here…I would love to have you. This month’s Hostess Code is HTFRSXSD, please use it at check out if your order is under $150, Thank You!!!! I am using the Stamparatus today with this technique. If you do not already have a Stamparatus you are going to LOVE IT! Consider it with your next purchase because it is simply AMAZING to work with. Here is a quick graphic to show you what I have done. 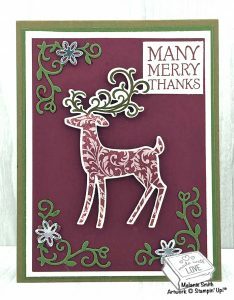 This technique can ONLY be done with Stampin’ Write Markers, NOT alcohol markers like our new Stampin’ Blends. So make sure your using the correct ones. 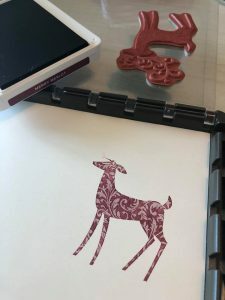 In this first photo I am inking the bottom portion of the deer with the Merry Merlot Marker. 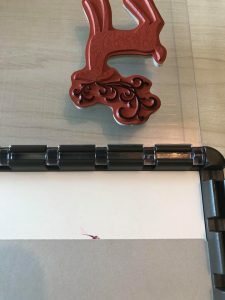 Just color directly on the stamp and then put your stamp to paper. The beauty of the Stamparatus here is if you for some reason do not get a good first impression you can simply do the step a second time. If you look closely at my inked image here. It is not completely colored so I did ink it twice. 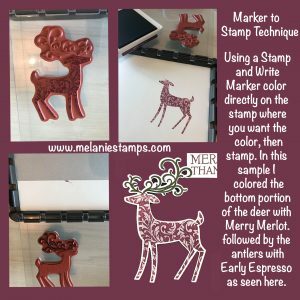 Lastly clean the stamp and ink up just the antlers with the Early Espresso Stampin’ Write marker and stamp again. I have covered the bottom portion of my deer with scratch paper so I do not accidentally get the Early Espresso on the lower portion. 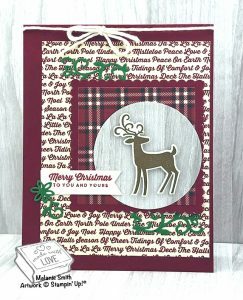 Here is the finished outcome up close… Isn’t he just beautiful? CASE = Copy and Share Everything. For those in the paper crafting world it is a well known phrase. 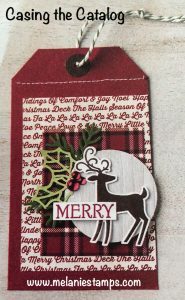 As you can see I almost cased it exactly but did make it larger (Card Size) and I added a few dies from the annual and holiday catalogs. I just love how it turned out don’t you? 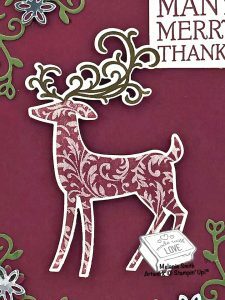 Don’t forget the inside of your card… and of course the envelopes too…. 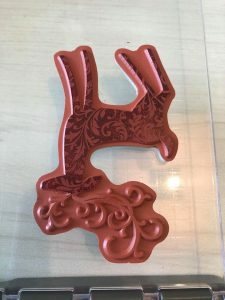 This little deer is just perfect for both! One last look… All the items are pictured below…Beware some of these items are on the “Low Inventory List” so if you already know you are loving these items grab them while you can. If your order is under $150 please consider using my hostess code for the month. It is HTFRSXSD and can be entered as you are checking out. 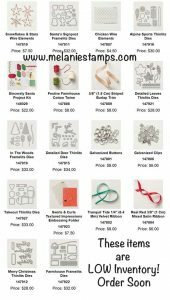 This week we are focusing on one of my absolutely favorite bundles in this years holiday catalog. 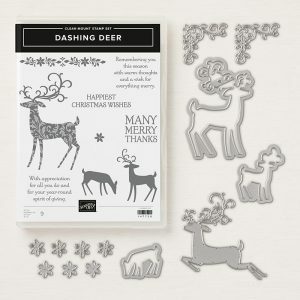 The Dashing Deer Bundle. This bundle has so much detail and I have had so much fun playing with it. Watch out all week as I bring you a ton of inspiration using these products. My favorite holiday color scheme is gold and ivory so I had to make this card first. 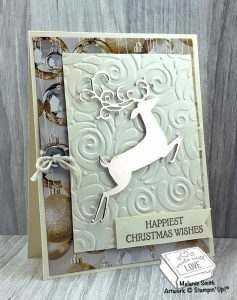 I have used the All is Bright Designer Series paper in the background along with the Swirls & Curls Textured Impressions Embossing Folder. For a little extra touch I added the Galvanized Buttons & Festive Farm House Cotton Twine for an extra touch. Don’t forget to add on your favorite foil paper when ordering. I will include links below for everything to make it easy shopping. 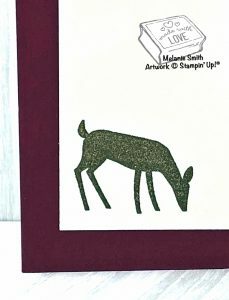 Thank you for choosing me as your Personal Stampin’ Up! Demonstrator. You are very appreciated!